There’s something here for you whether you’re a skilled developer, designer or finance expert looking for a nice contracted position to sink your teeth into. As the site focuses on delivering the top 3% talent to companies who need them, you need to be on top of your game to compete on this website. This also means that you can work for blue chip clients, and also expect to earn top dollar here. To register, you will need a Skype account at the initial stage, and you will also need to go through a rigorous screening process. RemoteOK is focused on finding you jobs which you can do from anywhere. While the site is heavy on tech positions, it does also include a small number of non-tech roles as well. It also features a handy tool at the bottom which offers the chance to get updated when new roles are added. This easy-to-navigate job portal very quickly gives a feel of the quality of jobs available from the first page. The site seems very well updated with a rich variety of jobs across various sectors from healthcare to management. We work remotely is the best place to find and list jobs that aren’t restricted by commutes or a particular geographic area. The website is great for finding remote-based work for people who have a deep desire for job security, without being physically present. The site also features a rich variety of technical roles for those who aren’t technically focused. Jobspresso boasts of 1000+ remote working opportunities. The website features long-term, salaried opportunities which allow you to work remotely from anywhere in a variety of roles such as marketing, tech, customer support and more. At the time of this post, we also found jobs available from Bluechip companies such as Amazon and Zapier. Remotive is a job search network for finding remote working opportunities. While it offers a variety of job categories, the featured jobs are a little heavy on tech positions. You can also subscribe to get a daily summary of new jobs so that you don’t waste your time logging in to check for updates. Skip the Drive offers a “free service for job seekers looking for remote-working opportunities”. There is no need to register, and the site is well-updated site with jobs defined by category, ranging from accounting to insurance – all remote. If you’re a techie looking for a remote opportunity, this site is for you. Remote Tech Work features a variety of long-term, salaried tech opportunities which employees can work on from anywhere in the world. Opportunities exist for all sorts of tech workers from QA engineering to scrum masters. 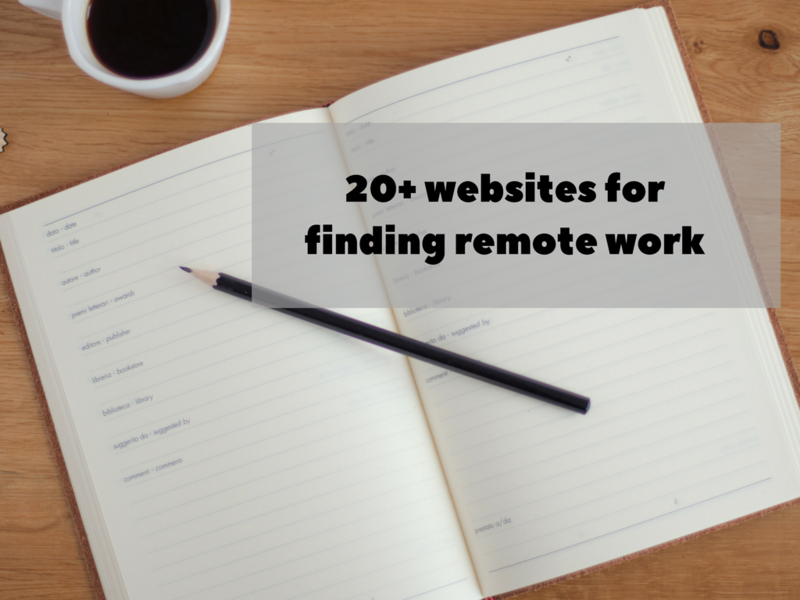 For techies, this is yet another resource for seeking remote long-term work online. The beautifully designed site features a toggle which helps you narrow your search down to remote jobs only. The site is also very well updated, with long-term remote working opportunities being posted everyday. If you would like to work in a Startup, this website is for you. The sign up process is a bit tedious I must admit, but I guess the depth of information is required so that companies can headhunt you, rather than you chasing after them. Flexjobs is a job search platform which features a wide range of job categories. Whatever your preference, there is likely to be a job for you on this site whether you want to work remotely full-time, part-time or you just want a volunteer part-time remote job. Freelancer.com basically does what it says on the tin. It offers freelancers the opportunity to bid on jobs in a variety of web-centric roles – data entry, logo design, web design, translation, SEO etc. Like freelancer, Guru is a marketplace where employers requiring specific web-based tasks done can post their jobs and freelancers like you can bid on the jobs. It also encompasses a wide variety of job areas from web development to social media management. I had never heard of this website before now, but it holds a thriving community of freelance jobs across various categories. Payment options on this website include Paypal and Payoneer, for those who might work from countries with restricted payment options. If you love to teach, then this might be the remote opportunity for you. Lingoda offers remote workers the opportunity to teach languages (English, French, Spanish and German) over Skype. You need to love teaching, and be a native speaker of the language you want to teach. You can sign up here. Preply is a language learning private tutoring site, and is great if you are able to teach a language. You find language learners via the website, and offer them language lessons over Skype. Payment is then made to you through Payoneer, Paypal or Skrill. There are so many world languages missing from the list of language offered, so if you are bi-lingual, sign up as a tutor. This site features a wide variety of specialist telecommuting jobs for people who want to establish a remote working career. Most of the featured jobs are for American companies, and for remote workers wanting to build long-term careers. So these are salaried roles. If you have administrative skills you would like to offer remotely, this site is for you. According to the website, virtual assistants are currently in demand for the following roles: word processing, data entry, book keeping, accounting, medical billing, coding, legal assistance, and basically any administrative job which can be carried out remotely. There are no fees needed to register on this site, so if you are testing the waters as a freelancer, this is perfect for you. For bloggers, this is a great site to find blogging/writing jobs across various niches. The job board features high-quality writing jobs which pay a decent wage, and some of them might even end up turning into long-term roles. Blogging pro is another freelance writing site which specialising in finding jobs for writers and bloggers. The site features a variety of content writing roles, with about 1 – 2 new roles being added daily. Everyday, this site curates the best freelance writing opportunities into a post. The site is simple, but the jobs are well worth looking at. The best thing about it is that because the list is hand curated, it contains as few “remote-but-USA-only” jobs as possible. GrowthHackers is a specialist growth/marketing website, so the job board offers jobs tailored to this category. It’s hard to say how whether or not the jobs featured on the site are recent or not, but my guess is that the listed openings close once the positions have been filled. Also, not all the jobs are 100% remote-based, so you would still need to check for any clauses that ask you to be present at a location. Inbound.org is the digital answer to the travelling salesman. This site specialises in online marketing, so if conversions, click funnels, click through rates are your language, check out the job board! Idealist is a platform which connects “idealists” with opportunities all over the world. While it does not specifically offer remote working opportunities, it does offer opportunities for people who (perhaps are otherwise remotely employed) who want to see the world while doing work that makes an impact on society. The site is very frequently updated, and you will be able to find paid and unpaid work in every country under the sun. Escape is a website with a mission – “to liberate one million people to do work they love”, with a belief that in 2017, everyone has access to a 21st-century career. Truer words have never been spoken. True to their word, the website features a huge variety of global opportunities – paid and unpaid. You can adjust the search options so that you only view remote-based jobs.